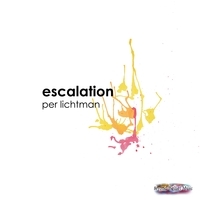 Beyond Belief Music Corporation presents Per Lichtman's epic electronica single "Escalation". Vocalist/lyricist Katlin Rivers rejoins Per Lichtman for the first time since their chart-topping 2005 collaboration "Are You Gonna Win", continuing to finely ride the line between electronica angel and techno temptress with a finely-tuned minamlist simplicity. Jeff Ball provides Rivers' Washington based vocal recording during a break between orchestral performances and game scoring projects. All-star DJ/producer/composer Andy Hunter° (www.andyhunter.com) takes us from the epic soundscape of the original mix to the groove, drive and elegant simplicity of his unique, club filling U.K.remix. The magic touch of acclaimed Nashville mastering engineer Richard Dodd (www.richarddodd.com) elevates Escalation to new heights with the same skill he brought to Hunter's smash hit "Life" while providing a fresh remaster for "Are You Gonna Win". Sought after Los Angelan illustrator, Kim Gray, (themercurial.blogspot.com/) brings an elegance of composition and color to Escalation's cover design while young photographer, Jessica Codispoti, provides Per Lichtman's promotional photography.